There has been a great deal of talk about Fatima over the past years since Pope John Paul II revealed [as he desired] what was presented as the Third Secret. There was a great deal of talk about Fatima in the polemics that followed the revelation of the Third Secret, which many believe is [still] incomplete. We all remember the Secretary of State, Tarcisio Bertone on national television, presenting the notes written by Lucia and the envelopes which contained them, so as to disprove those who sustained that the Third Secret had been only partly revealed. We all remember the well-documented book by Antonio Socci “The Fourth Secret of Fatima”, and the lively debate that followed. Well then, there has been a great deal of talk about Fatima, but what has become of the devotion to the Immaculate Heart of Mary? Certainly it is very much alive in some restricted circles, but is it still preached and practiced in the actual fabric of our parishes? To us it would appear not. The practice of the first 5 Saturdays has practically disappeared, almost as if it were for ‘little souls’ which no longer corresponds to the way the Church nowadays intends devotion to Our Lady. Of course, nobody will publically deny that one can be devoted to the Immaculate Heart of Mary, but they will present this devotion as a question of personal piety and more effort than it is worth. But this is not the case! Faced with the disaster of the world becoming more and more atheistic, God Himself intervened at Fatima, indicating the way out of the destruction of humanity: devotion to the Immaculate Heart of Mary. “The war [World War I] is going to end: but if people do not cease offending God, a worse one will break out during the Pontificate of Pius XI. When you see a night illumined by an unknown light, know that this is the great sign given you by God that He is about to punish the world for its crimes, by means of war, famine, and persecutions of the Church and of the Holy Father. To prevent this, I shall come to ask for the consecration of Russia to My Immaculate Heart, and the Communion of Reparation on the First Saturdays. Two years before, in 1915, the Angel of the apparitions invited the children to pray prostrated with him in reparation for the offenses to God by sinners, with especially these words: “Most Holy Trinity, Father, Son and Holy Ghost, I offer You the most precious Body, Blood, Soul and Divinity of Jesus Christ, present in all the tabernacles of the world, in reparation for the sacrileges, outrages and indifference by which He Himself is offended. And through the infinite merits of His most Sacred Heart and the Immaculate Heart of Mary, I beg of you the conversion of poor sinners." Is this acceptable to the “renewed” Church of modernity – to the so-called post-conciliar adult Christians? When considering Fatima, they speak of the assassination attempt on Pope John Paul II and the Christians killed in the 20th century as if these were at the heart of the message – but they speak no more about reparation. Why? It is simple - because the outlook towards the sin of man and the mercy of God has changed: in short, for the new Christians, sin no longer offends God. Here we go again: modernist Catholicism modifies the dogmas and the truths of the Faith. When it does address sin it does not say anymore what the Church has said for nineteen centuries. For the modernist, in theory or in practice, sin hardly exists any longer, since it does not offend God. Sin, they say, does not offend God, but harms only the sinner. Sin, they say, does nothing to God. Sin, they say, does nothing but harm the sinner by making him lose Divine life – this [at least] is conceded – but, at the same time, it offends other people. With these conditions, sin no longer has the characteristic of an offence or the destruction of honour towards God, of His glory, of His praise; it no longer has the characteristic of disobedience towards the laws of God. To sum up, sin is no longer Catholic, and thus does not need any reparation! Let us be aware now brothers and sisters - how can they speak about Fatima, when they have destroyed the heart [of the message]? We need to be vigilant against a false and merely sentimental devotion to Our Lady which will never bring us to what the Blessed Virgin asks of us continually: our conversion, for our own good and that of the whole world. A new religion has arisen which destroys the basic concept of sin. “Further, it is said that, as a consequence, God does not chastise sin with some temporal or eternal punishment. Since sin does not offend God, He will not punish it. In any case God is goodness itself: how could He inflict punishments on sinful man? No, it is man himself that punishes himself, suffering the consequences of his errors, and hell – if there is anyone there – is nothing other than exclusion - self-exclusion - from divine love. So hell (for these false modern Catholics ) is not a punishment inflicted by God anymore. God no longer has the right to punish. Consequently man is exempt from any duty in making reparation to God. That is, what we call, in our catechism - the satisfaction for sin – the fact that the sinner must satisfy Divine Justice because of his sins. Satisfaction – the need to expiate one’s own sins so as to make reparation to God’s honour – does not exist anymore. Man needs only repair his own spiritual health. Making reparation to the glory of God, cooperating in the saving of creatures fallen into sin, is not required anymore! But some will say what happened to the Mercy of God? The infinite Mercy of God is All on the Cross, where Jesus repairs for our sins with the shedding of His Most Precious Blood. Jesus, satisfied Divine Justice by dying for our sins. This Mercy is infinite. This satisfaction is infinite – and requires us to be part of the great reparation! What sense would the Passion and Death of Jesus Christ have, if it were not for this satisfaction of God’s Justice? The Cross of Christ would become a kind of sham, of [merely] a ‘good example’ given by Jesus showing how He loves us! No! Jesus satisfies Divine Justice, truly makes reparation for our sins and does not make a “puppet theatre” of His love. But He does more: He asks us, in His Mercy, to participate in this great reparation – not to deny it! You belong to the Mystical Body of Christ, you have been given the grace to offer up your sacrifices everyday, in union with the Cross of Christ, so that you may make amends for your sins and those of the world: this is the dignity of the Christian! God, in Christ, makes use of the difficulties of living! Without this goodness of God which renders your suffering valuable, it would be infinitely sad because it is empty. What a grace! However, it is necessary to accept the truth of faith enclosed in the word “reparation” so that this grace is activated. Let us live the month of May being faithful to the Rosary but also with this spirit of reparation. I often recite this prayer at communion time. The new parish that I am at uses glass or crystal chalice, ciborium, and patens, and they consecrate the precious blood in a pitcher, then dispense it to glass goblets for the EMHC's. They had rocks in the holy water font during lent. 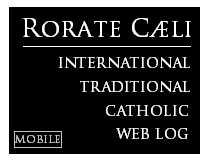 Nobody stands for the Orate Fratres. The priest seems never to use the confiteor, only the kyrie. The music is guitar, along with wind chimes (last mass). There is a semi-retarded kid in the congregation who plugs his ears during the music (LOL) but I don't think I could get away with that. The homily for the Ascension was that the bond between us and Christ is unbreakable, and will exist forever, just like the bond that psychologists say exists between a mother and her child. Our job is to live Christ in the world, and spread love. It strikes me that perhaps this priest does not believe in sin. Oh yeah, The bookshop sells copies of books by Sr. Joan Chittister and Cardinal Bernardin. I think we still need to pray and make reparations, not only for our souls, but also for these others, who will not make it into heaven unless we pray and make sacrifices. I wish I could be a tenth as devoted as little Jacinta was. I would love to make the Five First Saturdays, but I do not have access to the Mass on Saturdays. Can you make this devotional without assisting at Mass? 'This devotion can also validly be accomplished on the Sunday following the First Saturday, in case my Priest gives his permission for this based on just reasons.' (To Sr. Lucia, night of 29-30 May, 1930). All elements (Holy Communion, Confession, Rosary and Meditation must be done with the intention to repair for the sins committed against the Immaculate Heart of Mary. "Faced with the disaster of the world becoming more and more atheistic, God Himself intervened at Fatima,"
When I was a child attending Catholic school in the 50's the nun who was preparing us for our First Confession explained 'reparation' thus: If you throw a rock through your neighbour's window you will own up to it and confess that you are sorry BUT you still must replace the window or you will not have repaired the damage done to your neighbour. It is the same with God. You sin, you admit your guilt, you ask for forgiveness AND then you repair the damage by making sacrifices to set matters right. I've remembered that all these years. God bless those good nuns! For those who have come to the conclusion or may have been 'convinced' that the consecration of Russia to the Immaculate Heart of Mary was accomplished, I would kindly ask them, "If this is true, then where is the peace that Our Lady promised?" We are in an all-out spiritual war within the walls of our very own Catholic Churches! It seems that the hits just keep on coming: Maciel, Duran, Philippe (maybe also Buela)...who is next? Has reparation been forgotten because the emphasis has been placed on the consecration of Russia instead? Our Lady came in 1929 to formally request the consecration of Russia. If Pius XI had acted promptly, the horrors of the Gulag, which began a year later, could have been avoided. Pius XII did consecrate Russia by name in 1952, but without the participation of the world's Bishops. Russia's war on her own citizens tapered off after that. The Soviets were done causing trouble in the world after JPII repeated the consecration and Russia's main naval base exploded. Didn't Our Lady say the Holy Father (no mention of Bishops) would consecrate Russia, but it would be late? That's exactly how it happened. The request for reparation came after the Fatima seers were given a vision of hell and largely ignored by the Fatima experts. This scenario interprets "conversion" as a turning away from violence. Our Lady (in an apparition that has received episcopal approval) said at Akita Japan : "As I told you, if men do not repent and better themselves, the Father will inflict a terrible punishment on all humanity. It will be a punishment greater than the deluge, such as one will never have seen before. Fire will fall from the sky and will wipe out a great part of humanity, the good as well as the bad, sparing neither priests nor faithful. The survivors will find themselves so desolate that they will envy the dead. The only arms which will remain for you will be the Rosary and the Sign left by my Son. Each day, recite the prayers of the Rosary. 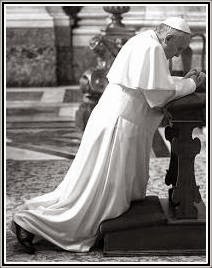 With the Rosary, pray for the Pope, the bishops and the priests. The work of the devil will infiltrate even into the Church in such a way that one will see cardinals opposing cardinals, and bishops against other bishops. The priests who venerate me will be scorned and opposed by their Confrères. The Church and altars will be vandalized. The Church will be full of those who accept compromises and the demon will press many priests and consecrated souls to leave the service of the Lord. The demon will rage especially against souls consecrated to God. The thought of the loss of so many souls is the cause of my sadness. If sins increase in number and gravity, there will no longer be pardon for them." Are we now living in the times of the Triumph of the Immaculate Heart of Mary? Doeas any man dare say so?How many abortions, homicides, suicides there are. How rampant is homosexuality? How widespread is euthanasia? The UK has been cloning human-animal hybrids in the laboratory for some time now. Come Lord Jesus! If you look around these days are full of wickedness and evil ...so much violence and hatred prevails...and Our Blessed Mother has foretold all of this ..even within the walls of the Holy Catholic Church...and why don't we hear more from our priests on the importance of Fatima and the First Saturdays ...and making reparation. If you know the Message of Fatima and you know about the First Saturdays then LIVE IT , and tell others about it ...for the salvation of souls! For the Love of GOD: Proclaim the TRUTH at all times!